Sounds like a rugged individualist. 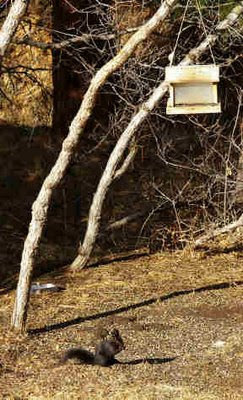 The aberts squirrels in my area (Pine, CO) will eat seed that has spilled on the ground under the feeders, but are seen most often in the trees. I've seen them eating doug fir cones as well as ponderosa. Perhaps the diet is more varied than thought or the aberts have occasional cravings for other foods.